There are three camels that will be used for rides at the Fair: Tonto (13 years old), Big Al (11 years old), and Eastwood (6 years old). All of them are Dromedary camels, meaning that they have one hump. Two humped camels are known as Bactrian’s. All three camels were purchased from domestic breeders in the United States, as camels are no longer allowed to be imported into this county. These camels give rides at a variety of fairs and other events. Over the past couple of months, they have given rides at fairs up in Oregon. These camels are given care up to the highest ethical standards and are treated as pets. They enjoy a diet that is similar to what many horses eat: grass hay and grain. All three camels are extremely docile and enjoy being around people. Contrary to what many people think, the humps of camels are not filled with water. Instead, the humps are filled with dense fat. This fat can hold water for up to three weeks. This adaptation allows camels to survive for long periods of time without water in the desert. In addition, camels do not spit or bite like many people believe. 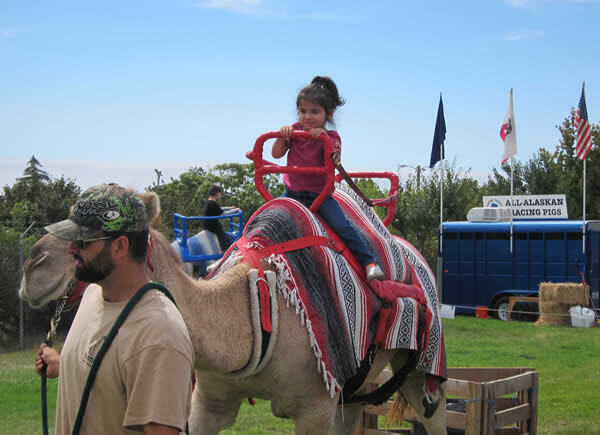 This opportunity to ride camels is one more reason why the Fair is fun for the entire family at an affordable price. The Santa Cruz County Fair will be taking place through Sunday, September 15 at the Fairgrounds located right off Highway 152 in Watsonville. 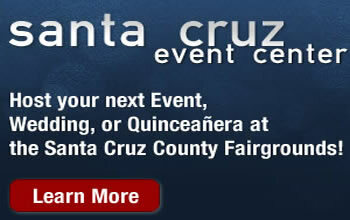 Complete Fair details, including daily hours, are available online at santacruzfair.com.